Does the DAP Shopping Cart integrate with Paypal Standard or do i have to have a Paypal PRO Account? The good news is even if you have a regular Paypal Standard/Business account, you can use the DAP Shopping Cart and integrate it with your Paypal Standard Account. Checkout With Just Paypal Standard! What are my options with DAP Shopping Cart => Paypal Standard? You can allow your users to pay using their Paypal account. When they click on the ‘Checkout with Paypal’ button, the users will be transferred over to the Paypal site where they can pay using CC or pay using their Paypal Account. Please NOTE: If you sell a one time product, then your users will have the option to pay using CC or Paypal on the Paypal site. But if you sell subscription products, then the users can ONLY pay using their Paypal Account so the subscription info can be stored and processed by Paypal. The DAP Cart comes with an awesome coupon management system. a) Cart level discount: A fixed total discount for the entire cart. b) Product discount: A fixed total discount for selected products only. Allow your buyers to pick their OWN password for their membership account before purchase. DAP will use the user-picked password instead of generating a password for them. 4. Capture Email Addresses Even For Failed Purchases! You can pre-register customers using the DAP Cart. So even if they get transferred over to the Paypal site and their payment fails or they abandon the purchase process, the DAP Cart will create an account for the user and set the status as “P” (pre-registered). This way you will have a way to communicate with the buyers even if their purchase fails. Your existing users will have the option to login to their membership right on the checkout page before they make a purchase. They will see a login form at the top of the checkout form. The new product purchase will be attached to their existing membership account. 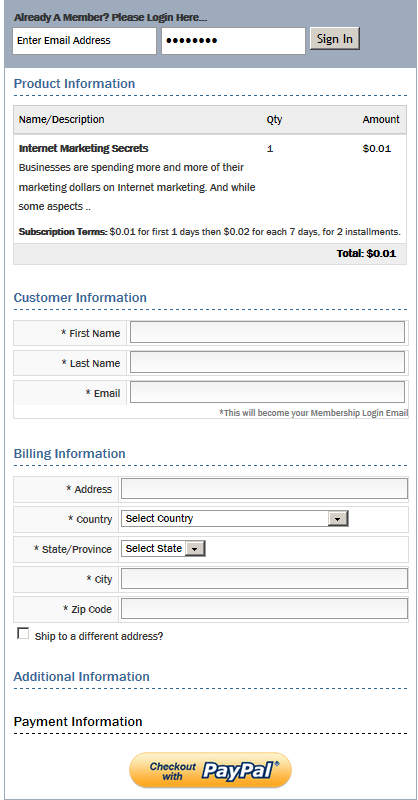 Their existing billing and profile info will get pre-populated on the checkout page upon login. If the user’s have an existing account and are already logged in to their membership when they make a purchase, DAP will NOT create a duplicate account. DAP will simply add the new purchase / product under the same logged-in user account. Add any number of Custom Fields to your Checkout Page. As long as these fields have been defined as custom fields in DAP, you can capture them in the checkout page. It will be stored in the user’s profile. You can also have the users accept TOS (Terms of Service) before they make the purchase. Users do not have to wait for ‘welcome email’ for their login / download credentials. They will get auto-logged-in to the member’s area upon purchase, and can be sent straight to the downloads page or welcome page. Multiple items can be added to cart (via Add-To-Cart button) before final checkout. What are the limitations of DAP Shopping Cart => Paypal Standard? If you have a Paypal Pro, Stripe or Authorize.net account, you can do 1-click upsells using the DAP Cart and allow your users to pay using their Credit Card. If you have a Paypal Standard account, then the only way to do upsells is by using our Paypal Standard Upsell Tree Plugin (PUT). Please note: The PUT plugin will only allow payment via paypal account. There is NO CC Payment option. i) You can use DAP Cart that integrates with Paypal Pro or Stripe or Authnet and allows 1-click upsells via Credit Card Payment option. Generate main button and upsell buttons and then publish the main buy button on the main sales page and upsell button on the upsell page. ii) You can use PUT plugin to create ‘checkout with paypal’ button and setup an upsell flow. Then publish the main buy button on the main sales page and upsell button on the upsell page. This way regardless of whether the users pick CC or Paypal to pay, they will receive the upsell offer. Your users will be transferred over to Paypal where they can complete the payment. The users must have a paypal account to pay for a subscription product.